Every morning I stop by Peet’s for caffeine and sugar. While I’m waiting I peruse the art work on the walls, the product of an elementary school art docent program. I am eternally grateful to the dedicated parents who volunteer their time. In his Arts and Culture Plan, Barack Obama pledged “to promote the importance of arts and art education” as president. But up to now, the docent-led program is the only art education that most children receive. That said, it’s not difficult to guess what masterpiece inspired each child’s drawing: The majority of docents are not trained teachers, artists, or art historians, so their classes generally mimic the subject of a masterpiece, while the idea behind it is totally missed. 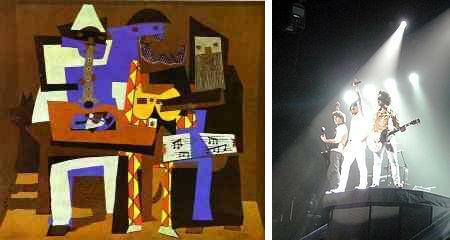 Show them Picasso’s “Three Musicians” and, rather than trying their hand at cubism, they draw a picture of the Jonas Brothers. FRANCE, Paris : Strobe lights, a famous DJ and… orange juice. 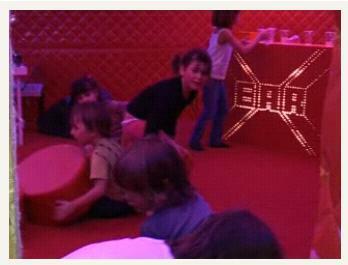 Babydisco is a nightclub with a twist: only children aged 4 to 7 can get in. Installed in the heart of the museum of modern art in Paris, the installation aims to introduce youngsters to pop culture and contemporary art forms. Much like the well-meaning art docents, the reviewer also totally missed the point, describing what they saw on the surface, possibly with the sound turned off. (It was in French anyway. BTW, those little kids speak French pretty well. Just kidding.) Obviously no one would seriously suggest that in the middle of a museum this was the best they could do to educate their young patrons. 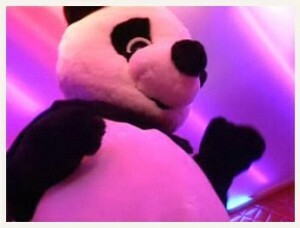 Weird dancing panda, the Ronald McDonald of Babydisco? Did the artists miss their own point as well? They could not possibly have sold a leading international museum on such a facile proposal. (Hey, that’s French, too.) They could have seen that corny “conclusion” coming from miles away. So what’s really the point? Babydisco is a savvy parody of the way children are indoctrinated as consumers. It’s a tasty, glittering pack of candy cigarettes. It’s a Kid’s Hot Cocoa©, keeping kids and parents dragging each other by turns into Starbucks. It’s the Happy Meal–the least subtly named product in marketing history–proffered by an insanely grinning creepy clown (which I guess is redundant). 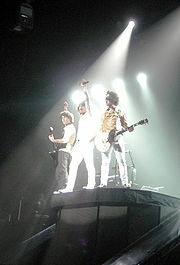 This entry was posted on Tuesday, December 9th, 2008 at 3:34 pm	and is filed under Artists, Events, Rants. You can follow any responses to this entry through the RSS 2.0 feed. You can leave a response, or trackback from your own site. That was a super interesting post. (I liked the bouncer at the end of the video).